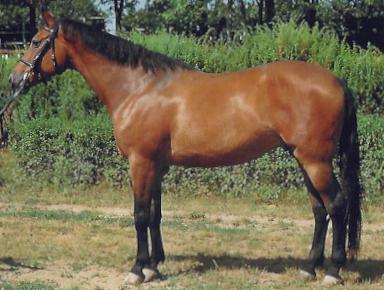 Kisber Felver was developed at the Kisber Thoroughbred stud ranch in Hungary. Many race horses were produced by the stud, including an unbeatable mare that is in the Guinness Book of World. The Kisber Felver horse breed was created over a hundred years ago from careful selection, and a controlled breeding program to create a desirable sport horse in conformation, movement, athletic ability, and temperament. In 1947 after the end of World War II there were very few Kisber Felver left in Hungary. 150 Kisber Felver horses were imported for the US Remount, but were sold at public auction in 1947 when the remount disbanded. Unlike other European imports such as the Lipizzaner, the imported Kisber Felvers were widely crossbred, reducing the count of purebred animals. In 1961, the Dalmand Stud took hold of the remaining purebred Kisber Felvers. The stud has continued the breeding to the day. Kisber Felvers are able to perform in all horse disciplines. They range in size from 15 to 17 hands.